There's a lot of buzz about Canada these days, especially among Americans brainstorming travel destinations. The country is celebrating its 150th anniversary in 2017 to much fanfare. But where to start? Quebec City is amazing for European charm, see my detailed post on what to do with kids in Quebec City on Ciao Bambino. Alternatively, Toronto is another great option for families thinking of Canada. It's got an amazing multicultural vibe, skyscrapers sure to impress, and a prime location on the shore of Lake Ontario that offers green space galore. Plus, typically great flight options and price points from most US locations. But big city travel (and Toronto is indeed big--4th most populist city in North America) takes a bit of pre-planning when visiting with children. 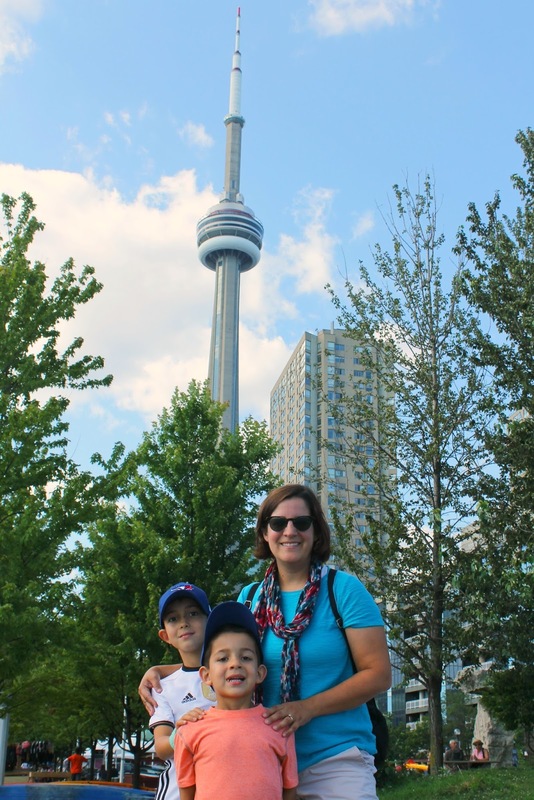 Unfortunately for me, I was so busy helping my Ciao Bambino clients plan their own summer travels that it was only a few weeks before we were due to depart for our Canada road trip when I began sketching out our time in the city. Here's where comes into play. This is a perennial favorite of families visiting cities around North America because it not only offers reduced entry into typically the most popular attractions (read: the places you'd be visiting anyway) but also helps you focus your time. And at certain attractions, their skip-the-line access is invaluable. So last month, my family put CityPASS through its paces in Toronto and had a blast. We only had one full day to explore the city, with 2-3 days you could more fully maximize the value of a Toronto CityPASS. The CN Tower is THE thing to see in Toronto for most visitors. Indeed, you can't avoid it, as the tallest building it is unmissable from anywhere in the city. -While the CityPASS does offer a special entrance line, everyone visiting the tower must pass through security. So I'd still advise getting there within the first hour that it is open to avoid a long wait at security. Plus, it will feel far less crowded at the top anyway and you'll have more space as a family to move around and enjoy the views. I had the false impression that with our CityPASS we would breeze right up to the top... not so. Get there early. -There's a fun play area at the bottom after you leave the Tower, with comfy couches for parents. We used this as a time for the kids to burn off some steam and for us to plan our next activity. -On a nice day, enjoy the waterfront area. We loved the beauty of the water in this area more so than the tower itself. (View is amazing though, and I was glad we carved out the time to see it.) It's also fun to stop at the Blue Jay's stadium. -This is also the perfect time to pop into Ripley's Aquarium, also included in the pass. We didn't have time as we wanted to explore other areas of the city, but the convenience of having two attractions side by side is fabulous for families. 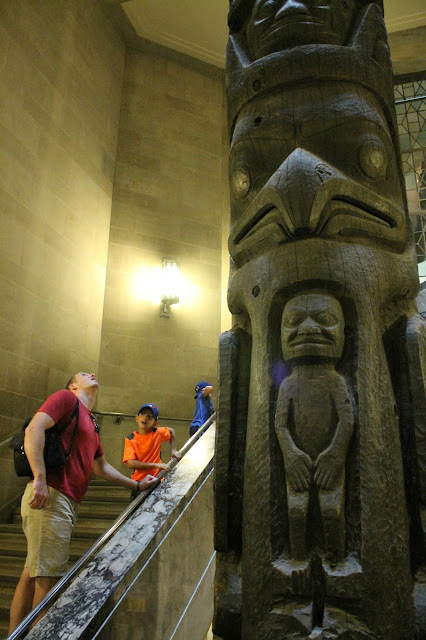 Since everything in Toronto feels "big," it's fitting that the Royal Ontario Museum is one of the largest museums in Canada. But unlike some museums, it doesn't feel overwhelming and it's easy to take a quick glance at the map and prioritize your time there based on family interests. You could easily spend a full day here, but we enjoyed hitting the highlights during our 2 hour visit. The dinosaurs are a must. We especially enjoyed that the diagrams of each fossil display shows which fossils are real and which were recreated. My boys really enjoyed trying to see a difference between the "real" and "fake!" -You may still wait in a short line to get your ticket checked and bag searched, but the CityPASS will allow you to bypass the ticket counter wait (looked to be about a 15 minute long line when we were there on a Sunday afternoon). -Special exhibits are an extra cost, however. -It's an easy walk to the University of Toronto campus with nice green areas if the kids need to run around after the museum. Given that we only hit two of the sites covered by the Toronto CityPASS we didn't see a huge cost savings. But had we hit even just one more attraction (we undoubtedly would have with more time in the city), then its value would have been easily justified. 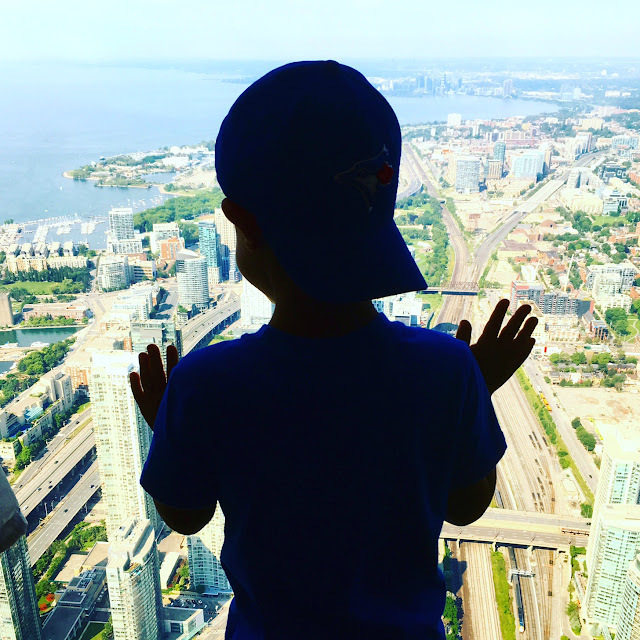 In addition to the aquarium near the CN Tower, Casa Loma, the Toronto Zoo or the Science Centre are all part of the pass package as well. Another perk of CityPASS is the time limitation is much more flexible. Whereas some tourist passes only allow you 24 or 48 hours, thereby forcing you to rush from one attraction to the next, you get many more days to utilize your CityPASS. I find this works much better with kids--it's hard to see more than 1-2 big sites each day. Have you used CityPASS anywhere? I'd love to hear your experience in the comments! Note: I was provided with two media passes for purposes of this review, but purchased two additional passes for the rest of my family at full cost. All opinions are my own. Links to the CityPASS page are affiliate links which help support this blog and don't change the cost for your family. Happy 8th Birthday, Big Arrow! 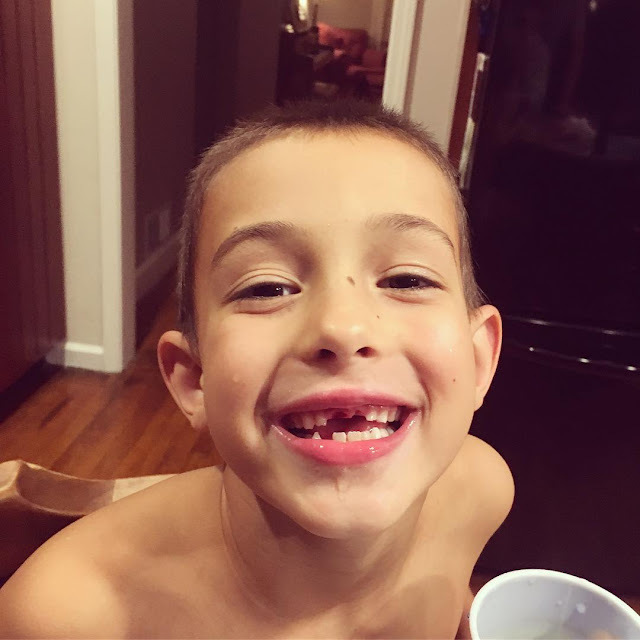 I like to write posts to the boys on their birthdays, and it is Big Arrow's 8th birthday this week (you can read his 2nd, 3rd, 4th, 5th, 6th, and 7th posts and Little Arrow's 1st, 2nd,3rd, 4th, and 5th at the links.) Maybe someday I'll carve out the time to actually write about our travels again! The sentiment of the quote that inspired this blog's name rang so true this year. I've never shared the full poem from which it comes. I have noticed you beginning to realize life beyond yourself. You ask questions about others, about their lives, about their struggles. Admittedly we sometimes tell you to stop being nosy or to quit interrupting when you need one of your million questions answered. My goal in the year ahead is to better help you with your thirst for all the details about the world around you. To share my thoughts, feelings and emotions about life, without pressuring you to necessarily share my world view. This is the year where I found I couldn't fix all your problems the way I could a skinned knee when you were 2 or a lost stuffed animal at age 5. Your issues are taking on a complexity that can best be handled by you. All decidedly first world, but a big deal for a sensitive 7-year-old. Now 8. You seem to recognize this too, though, and you are getting adept at "handling your business" (a frequent mantra in this house). I know that this will only increase as the months and years of growing older and more mature stretch before us. I'm confident you're ready for more independence, more self-sufficiency. I hope I am too! And since this is your virtual baby book... you also spent the bulk of the past year missing your two front teeth and it was quite possibly your most adorable phase yet. And playing lots of sports. And thinking about sports. And reading about sports. And writing about sports. And trying to con us into letting you stay up late to watch sports. This year, I plan to let you read all the past birthday posts I've written for you. And each year going forward from here, my birthday post won't appear on the internet and will instead just be something personal shared between you and I. As you get older, I find your stories are yours to tell, not mine. I hope your dad and I have been worthy Bows to you, sweet boy. You are certainly a very fine Arrow to us and everyone who knows and loves you.